During the cold winter months, construction professionals who use temporary, propane-powered heating equipment on the job site can be more productive, making it easier to finish projects on time and on budget. In addition to providing more comfortable working conditions, propane-powered heaters can also maintain the ambient temperatures necessary for common tasks like drywall installation or painting. However, like any portable heating device, propane-powered heaters must be used and maintained properly. A temporary propane unit that pumps hot air through existing ductwork. Ensure that propane cylinders are in good condition without bulges, dents, excessive rust or signs of fire damage. Always transport cylinders to the job site in an upright and secured position. Do not use a cylinder indoors that holds more than 100 pounds of propane. Connect no more than three 100-pound propane cylinders to one manifold inside a building. All manifolds should be separated by at least 20 feet of space. Check all cylinders for leaks with a suitable leak detector solution—not soap and water, which may have corrosive properties. Locate tanks a sufficient distance from property lines and the structure under construction. Consult local building codes to ensure proper compliance. Place the tank on stable ground, and when locating the tank consider the potential effects of freezing and thawing. Use rigid piping from the tank to the building. Flexible tubing may be safely used indoors. Have a qualified propane technician ensure that all connections between the tank and heater are free of leaks. Protect tanks and piping on the work site from the possibility of vehicle impact. Do not store combustible material within 10 feet of any tank. Choose a heater that’s sized appropriately for the square footage you want to heat. Keep heaters away from potentially combustible materials. Only operate heaters in ventilated areas. Make sure there’s sufficient air both for combustion and to prevent carbon monoxide accumulation. Use only those heaters with 100 percent safety shut-off valves. When the project is complete, first turn off gas at the container valve to drain hoses or pipes before shutting off the heater itself. Only allow a qualified LP gas technician to make any repairs to faulty equipment. While kerosene and electric heaters are also available, propane is the cleanest and smartest fuel choice for job site heating. Kerosene heaters can produce an undesirable film on nearby equipment or walls. Electric heaters can’t generate nearly as many BTUs as propane-fueled heaters and they put additional load on the mobile generators used to produce electricity for power tools used around the job site. For more information about the benefits of using clean, efficient propane on residential or commercial building sites, learning about new propane-powered products, or considering the financial incentives available on propane equipment purchases, visit the Build With Propane website. Yamaha Motor Corp. has added the EF7200DE/D generator to replace the EF6600DE/D model. The new model offers additional wattage, run time, standard accessories, and a host of features and benefits at a new, lower price. The EF7200DE/D offers customers Yamaha’s trusted reputation in an-all new generator designed to make on-the-job activities hassle-free plus offering a host of extras including fold-down locking handles and wheels which come standard on both models as well as a 3-year residential and commercial warranty. 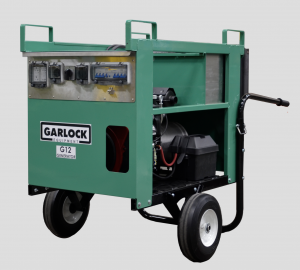 The battery is standard equipment on the electric start model. The push-button start on the EF7200DE sparks the 358cc engine to life with little effort while the recoil starter with auto decompression makes for an easy pull start on the EF7200D. With eight hours run time at full load, the EF7200DE/D offers 18-percent longer run time than the previous model. The three-year warranty is the same regardless of use – residential or commercial – and an extended service warranty (Y.E.S.) for an additional one, two or three years is available when purchased through Yamaha dealers. The digital hour/volt meter shows total run time and voltage output, which makes keeping track of service intervals a breeze. The EF7200DE weighs in at 234 pounds while the manual start version comes in at 212 pounds. Both feature a rugged design with full roll cage protection for heavy jobs. The Ground Fault Circuit Interruption (GFCI) senses a leak to ground to reduce the risk of shock.